What is it about turquoise and orange?! Mt. 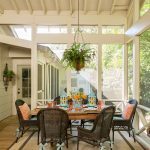 Pleasant, South Carolina designer Elizabeth Newman sure knows…the two complementary colors provide a fresh contrast that our eyes just eat right up! 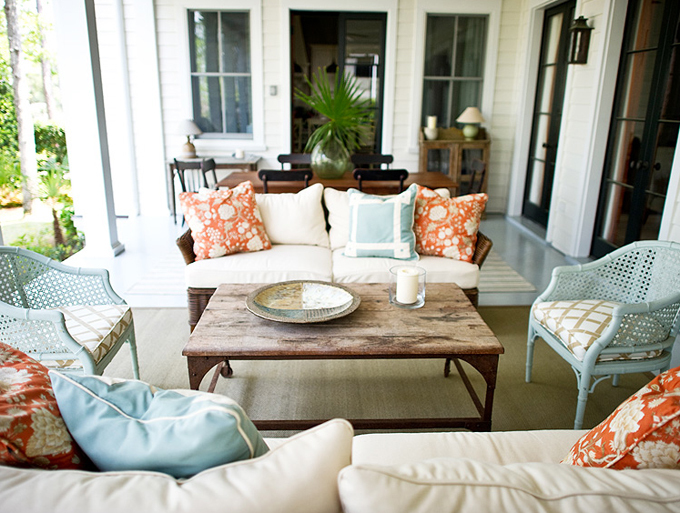 I love this porch so much, even if I’m craving an iced tea big time right now! 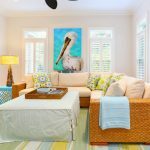 The bright throw pillows liven up the space, but it’s those aqua cane chairs that I am loving most! 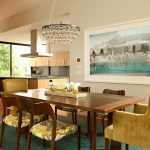 See lots more fresh, cheery spaces from Elizabeth right here! Oh an outdoor room! Makes me think about warmer times! Always love the blue and orange combo. Thanks for the spot of sunshine in an otherwise dreary day- haven't seen the sun for 5 days on now! Wondering if it still exists- Ahh… gotta love winter in southern Ontario!!! Had to come over here for some turquoise tranquility since I am still unpacking. 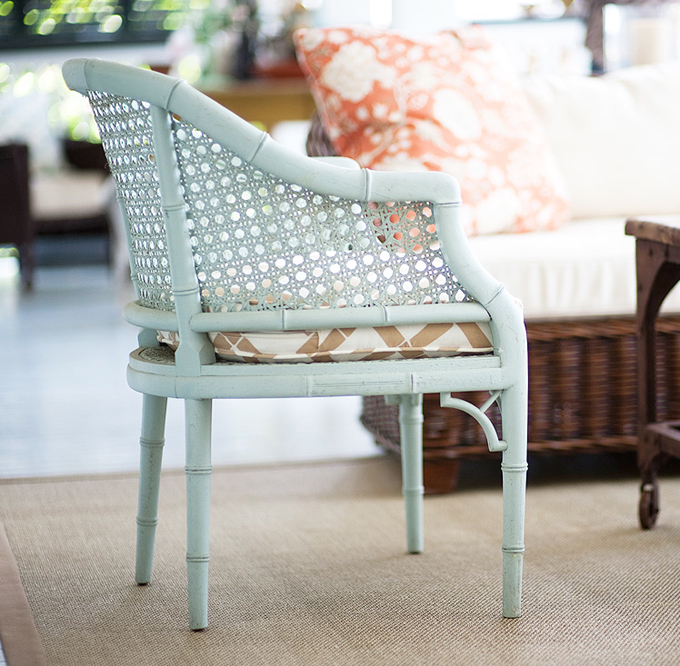 Love that sweet wicker turquoise chair. Always so pretty here at your House of Turquoise. Yes, please! I love those two shades together. 🙂 They really balance each other out. 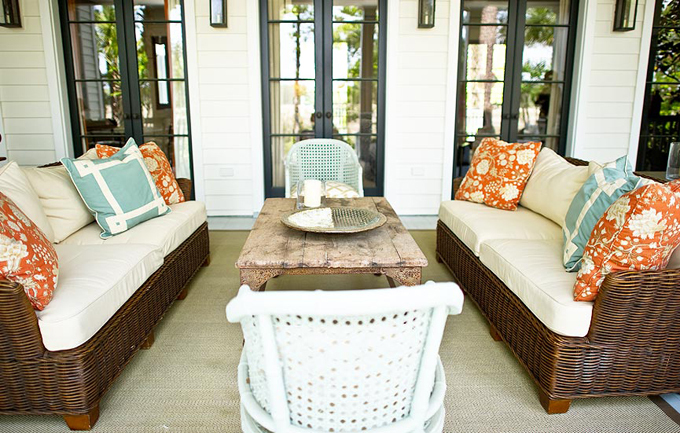 Loving those chairs as well, perfect muted shade of blue and just the right pops of orange in the loose cushions! Beautiful!! And as you can imagine, one of my favorite color combos as well – it's as if we had a baby!! Erin–Elizabeth Newman features some of the same projects on her website as Allison Elebash's website. I had to go back to your post from yesterday because I thought I was seeing things! Do you know if these two ladies collaborate often? Such pretty pics. Can't go wrong with that winning color combo! 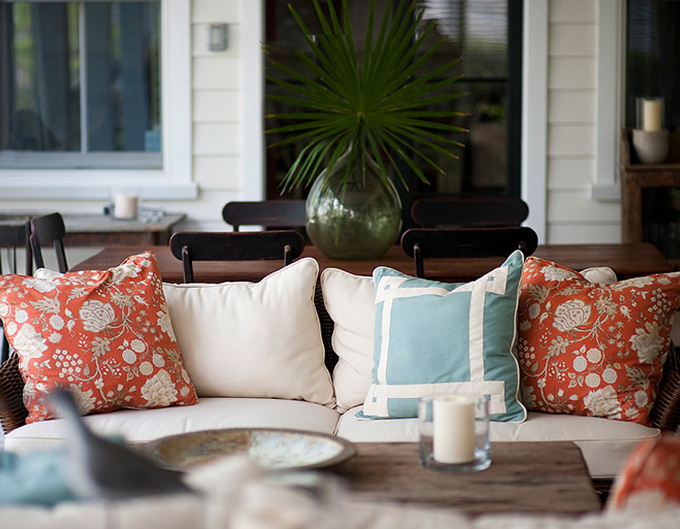 I plan on moving to a new place soon and I love the color combination of the pillows! The blue with the orange and white…it gives the room such a fresh feeling. Love it! I really impress by this type of designs.It look so fabulous and fantastic.Thanx to share with us this type of designs. Oh I love this veranda! The wind always blows to hard for us to have beautiful spaces like this!!! I missed this beautiful post when you first posted it 'cause I've been sick. I love the combination of orange and turquoise. Your post was perfect timing for a bridal shower I am planning for next month. The colors I chose were the soft aqua/turqouise and coral-orange (as her wedding is in Mexico). These photos got me very inspired and now I am super excited to get the ball rolling! I'm loving the turquoise and peach colors together! It really brightens the porch up.